“It’s only a bit of light drizzle,” were the words I uttered to our go-to photoshoot driver Jon Benson just a couple of hours ago. 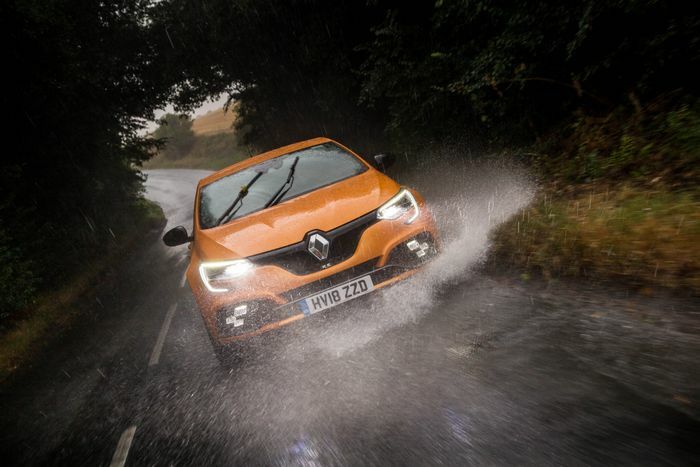 Words that are now ringing hollow as I aim my camera out the back of a Focus RS in the direction of the new Renault Sport Megane, which is smashing through rainwater so deep that there are actual bow waves emanating from the low front splitter. Typical, isn’t it? We’ve had weeks of scorching hot weather with temperature records broken almost daily, and Mother Nature decides it needs to absolutely piss it down on the day of the first triple test we’ve done in months. And sure, that makes for some nicely dramatic photos, but it also skews the test a little. Two front-wheel drive cars and one all-wheel drive? There’s definitely going to be a clear winner in terms of traction here. But what’s the idea of the setup we have today? 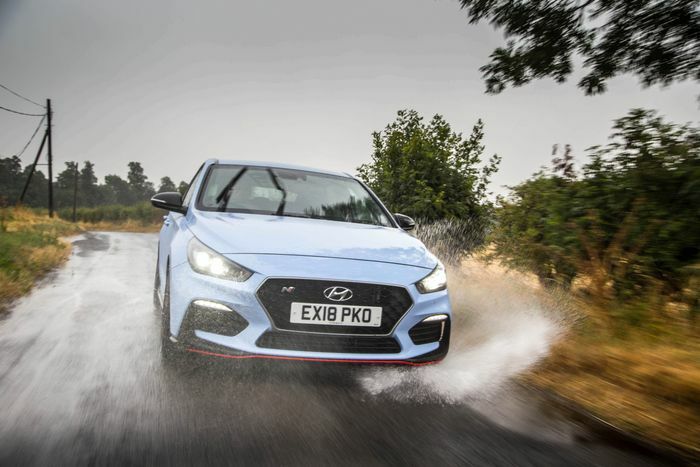 Allow me to explain: with ‘our’ Hyundai i30 N having convincingly defeating Seat’s sublime Leon Cupra R not so long ago, it clearly has the credentials. 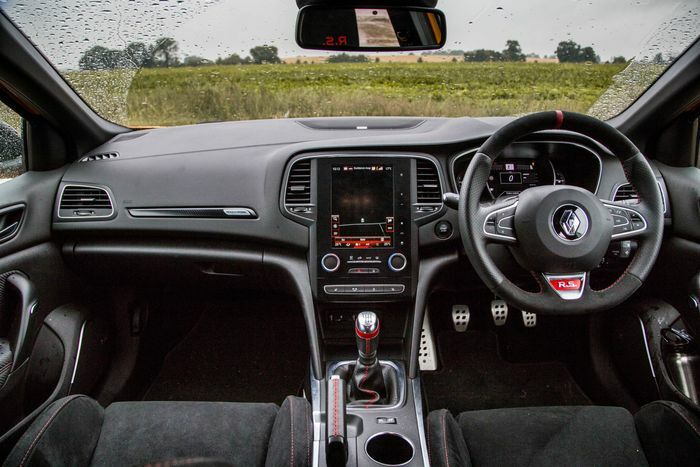 It’s the perfect car, then, to use as a reference point to help us figure out if the new Renault Megane RS is any good. But we needed an interloper - a car with a very different ethos. So what better machine to go for than the departing Ford Focus RS, here in Red Edition trim? It’s no longer on sale, but that doesn’t matter - it’s just here to stir things up a little. 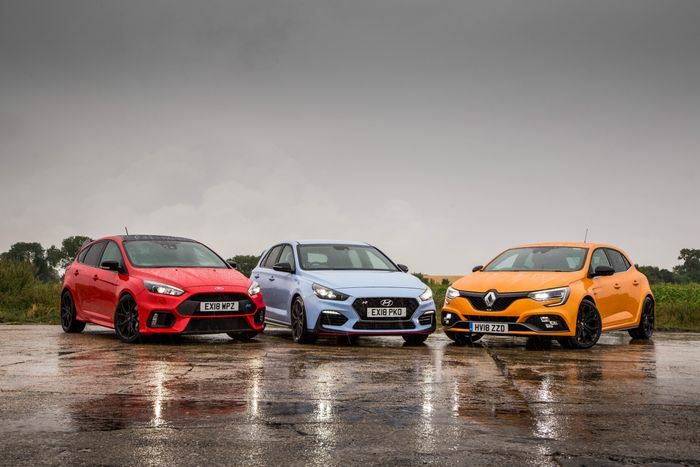 We’ll come back to this last hurrah for the ultra-hot Focus later, and start with the other RS: the one from Renault. And after spending quite a lot of time in the Hyundai lately, it makes quite a first impression, because everything is just right in terms of feel and placement. The pedals are beautifully weighted and perfectly spaced for a little bit of heel and toe. The six-speed manual gearshift is short, slick and meaty. And finally, the steering is pleasingly heavy without the weight seeming fake, as the i30 N’s does in Sport+ mode. I wrote recently about how few manufacturers nail this sense of ‘rightness’ other than Porsche, but Renault really isn’t far off with this new hot Megane. The trouble is, the experience falls a little flat when you start to press on. Yes, once you’re past the initial lag (of which there’s a little more than I’d like) from the new 1.8-litre inline-four turbo, it feels very quick, and yes, you do really feel part of proceedings when you’re getting the go-faster Megane more acquainted with your favourite local squiggle of tarmac, but something’s missing. Is it because it’s just too well insulated? Is it the sneaking suspicion it could take a lot more power (a pokier Trophy version is on the way) and cope with it just fine? It’s hard to nail down what’s not quite right here. It’s certainly an interesting car to drive fast thanks to its four-wheel steering - something not seen in this class before. Under 37mph the rear wheels steer the opposite direction to the fronts for more agility, and over that speed, they’re turned in the same direction for extra stability. And you do notice it in lower speed corners: at the point you’re usually running out of grip at the front - when you can feel the limited-slip differential shuffling power around - the rear seems to move ever-so-slightly to help you around the corner before understeer kicks in. At times, it almost feels all-wheel drive. 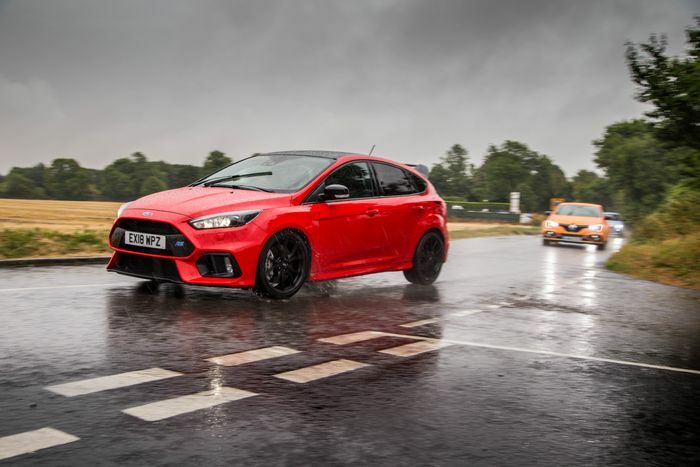 The limited-slip differential itself is fairly aggressive and sometimes grabby, and the damping is remarkably well sorted considering how little give there seems to be in the stiffer Cup chassis on this particular RS. It’s not exactly comfortable, but you won’t find the car skating around nervously on bumpier roads. Score one for old-school suspension tuning - there are no adaptive shenanigans here. But there’s never that sensation of being on the ragged edge that you get with most modern hot hatchbacks. That you’re pushing the boundaries of what’s possible. In the Megane, everything feels in hand. It’s fast and effective, but just not as thrilling as I was hoping. 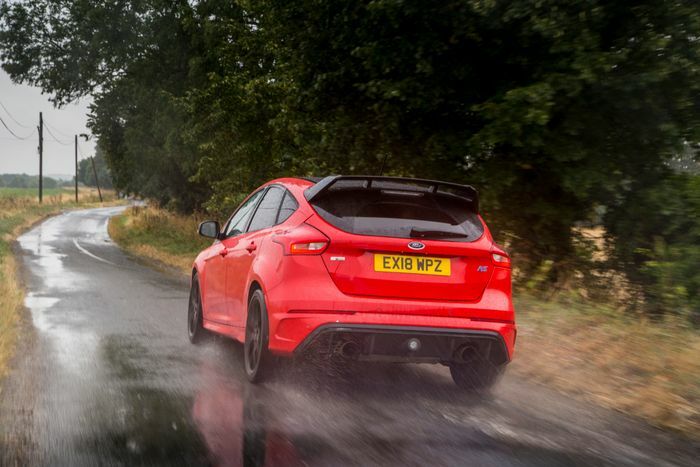 There’s no such trouble in the Ford Focus RS. It’s the only car here I haven’t been able to drive in the dry, but that doesn’t really matter: even in these conditions, you can stamp your foot on the throttle and the RS just hooks up. And good Lord, does it feel fast after being in the Megane. But it probably should do: this particular Red Edition comes with a warranty-friendly fiddle from Mountune, lifting the power to 375bhp. It’s just 1bhp away from outgunning the Renault by 100bhp. 0-62mph takes just 4.5 seconds, while the Megane takes 5.8 seconds to do the same and the i30 N 6.1. It does make an incredible fuss over accelerating quickly, however. There may not be any traction issues, but every throttle application unleashes hellish torque steer. It could be the power increase, it could be the Quaife ‘ATB’ differential - fitted as standard on the Red Edition - or it could be a bit of both. I certainly don’t remember the last Focus RS I drove feeling quite like this one under load. Factor in a harsh, jittery ride and steering that’s almost absurdly quick off-centre, and you have a car that feels as nervy and on edge as Morty Smith. 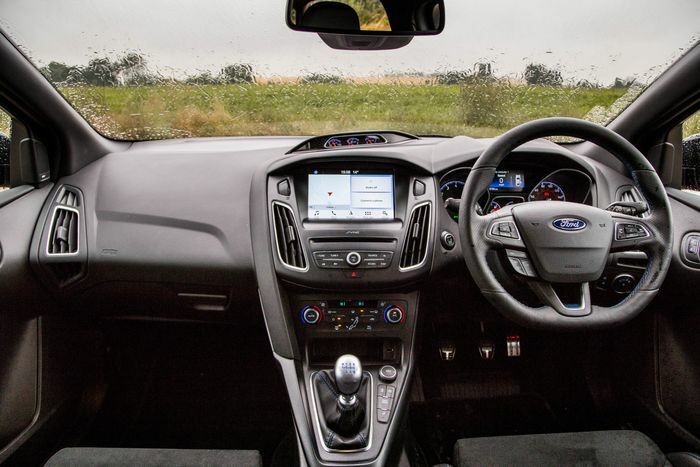 It’s certainly exciting, particularly as the trick all-wheel drive system starts to involve the rear wheels a little more, occasionally pushing the back out ever so slightly in the corners. Oh, and with a bit of space and some Drift Mode, it is possible (albeit tricky) to do donuts in it. Try doing that with in a VW Golf R.
It’s all very impressive, but I’m not convinced it’s for me, and I reckon keener drivers will be better served elsewhere. It’s also incredibly expensive. Ford may have grabbed headlines when the RS originally went on sale for £29,999, but the price steadily rose, to the point where this fancier Red Edition is a slightly terrifying £38,254 with options. That’s a little hard to swallow when you’re sitting inside a humdrum Focus cabin with a driving position that’s way too high. Granted, none of these cars have particularly plush cabins and the infotainment systems are all a little iffy, but only one vehicle here is pushing the £40k mark. 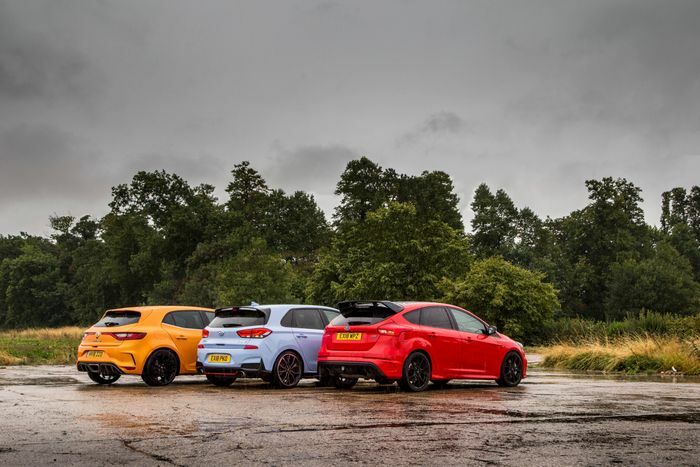 It’d be excusable if the Focus RS was £10,000 better than the i30 N. But is it? Nope. Not even close. 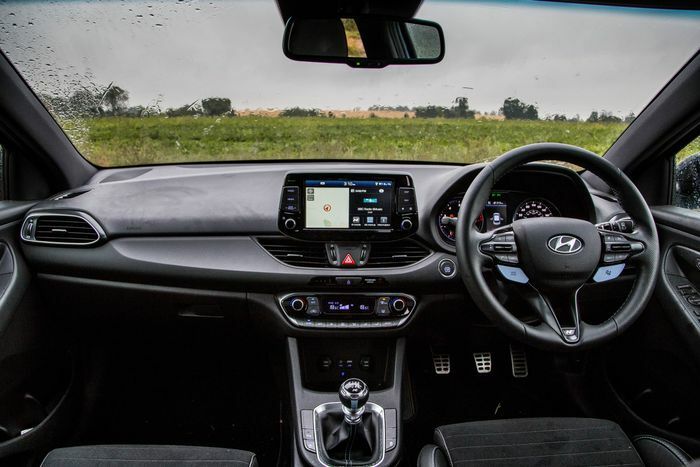 The Hyundai doesn’t feel that behind in terms of straight-line pace thanks to a burly 271bhp engine with a thumping mid-range, and in the dry at least, I really don’t think it’s that far off in terms of capability. It’s worth pointing out that the Renault does highlight some of the Hyundai’s faults. After spending the best part of a week in the Megane, I’m struck by just how horribly springy the pedals are. Then I try to rev match, and miss the throttle entirely, forgetting that the pedals are also so bizarrely spaced apart that heel and toe shifting is uncomfortable and difficult for anyone other than a contortionist. The gear shift isn’t as sweet, and there isn’t as much feedback from the steering either. But that excitement I’ve been searching for and missing in the Reanult just jumped out and slapped me in the face mere minutes after grabbing the keys to the Hyundai. It’s a furious little fireball of a thing that explodes down every road it travels with a hail of exhaust gunfire and a howl of tyre squeal. 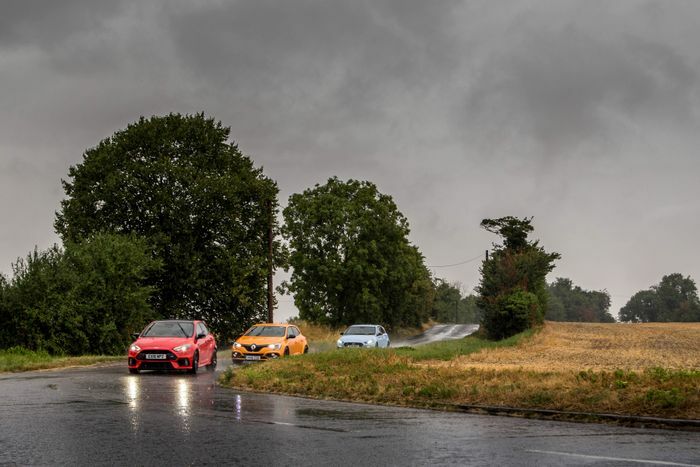 It struggles more for traction in the wet than the Renault does, but compare them both in the dry, and you’ll find it’s the Hyundai that has the stickier front end. Most importantly, even though it’s a properly serious bit of kit, the i30 N also has a sense of humour. The Megane RS? That’s just properly serious. Probably too serious. And not quite what I hoped it’d be. The silver lining is that this has happened before: with both the previous-generation RS Meganes, the earlier versions weren’t quite there, after all - it was the later cars that were lavished with praise. The generally accepted point at which the last one became a God-like hot hatch was the 265. The third-gen version is a decent starting point that will be engaging enough for many, but not the final form. For now though, the Hyundai i30 N is - once again - looking like the one to have. 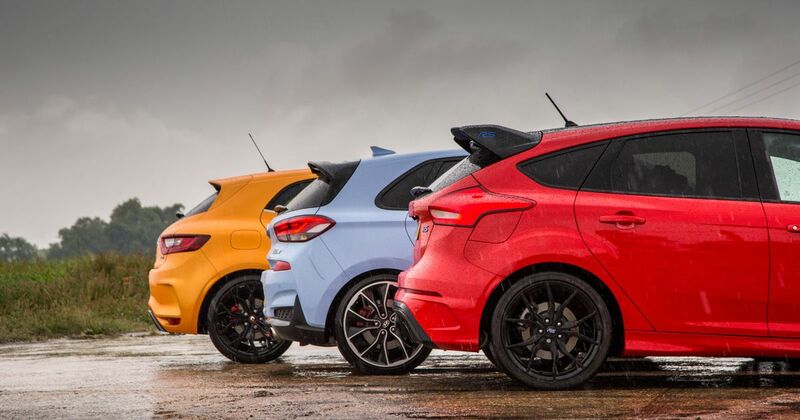 It’s taken on another hot hatch dynasty and come out on top. All while being significantly cheaper. I’m beginning to think there’s something in the water at Hyundai towers, and my god, is it working.